Before you venture out to the garden and harvest a bunch of flowers for the dinner table, it’s important to remember that some flowers are poisonous. Make sure you’ve made a positive identification of each variety you’re using. Obviously, you should avoid flowers that may have been sprayed with pesticides or other chemicals, so either grow your own organic flowers, or harvest them from a location you’re sure about. Organic or not, all flowers should be shaken and washed in cold water prior to use, as they may to be homes for insects. 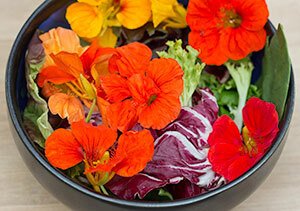 Pick your edible flowers in the morning, when they have the highest water content. Keep them on some dampened paper towel inside a sealed container in the refrigerator for as long as a week. You can revive wilted flowers by floating them in some ice water for a few minutes. Prepare them for eating just before serving in order to prevent further wilting. Remove the stamens and styles from flowers before eating. Pollen can cause allergic reactions when eaten by some people, and it may overwhelm the otherwise delicate flavour of the petals. The exception here is the Violas, including Johnny-Jump-Ups and pansies, as well as scarlet runner beans, honeysuckle and clover. The flowers of these varieties can be enjoyed whole, and will probably be more flavourful this way. This list of Edible Flowers is not comprehensive so if you notice a flower missing from this list, please do further research before you consider it edible. Don’t assume that all flowers are edible – some are highly poisonous. 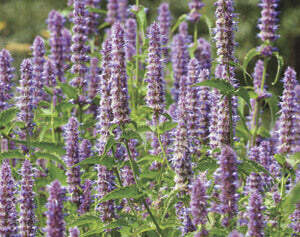 Agastache – Anise Hyssop (Agastache foeniculum) is also sometimes known as licorice mint. 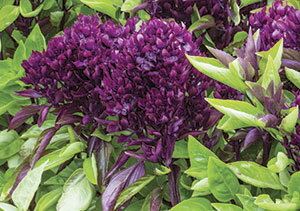 Both the young leaves and the striking purple flowers have a mild licorice flavour. Pull the purple flower tubes away from the central structure of the flower and scatter them in salads or fancy drinks for a pop of colour and flavour. Angelica – This relative of celery (Angelica archangelica) has licorice-scented pinkish flowers borne in large umbels. 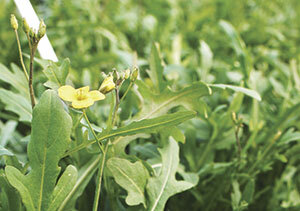 The flowers make an interesting addition to salads, but it is mostly grown for its stronger-tasting leaves. Apple – Be sure to only try flowers from trees that have not been sprayed. Apple blossoms (Malus spp.) have an appealing but delicate flavour and scent. They work particularly well with fresh fruit salads. 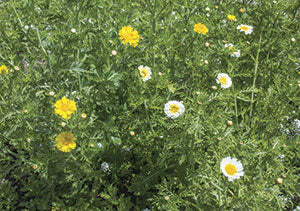 Use in moderation, as the flowers contain very low levels of poisonous chemicals. Arugula – Once this cool-season plant (Eruca vesicaria) begins to bolt, its leaves will have become tough and almost too spicy to eat. So let it bolt, and enjoy some of its very small, spicy, white or yellow flowers. They add a nice, unusual zing to salads. Basil – Most growers use basil’s leaves (Ocimum basilicum) before the plant has flowered. After blooming, the character of the leaves changes and becomes less appealing, but the flowers can be eaten. They may be white to lavender, but they look stunning when sprinkled over pasta. Thai basil is sometimes allowed to flower before whole stems, with leaves attached, are harvested. The whole flower is edible. Begonia – both tuberous (Begonia x tuberhybrida) and wax (B. x semperflorens-cultorum) begonias have edible flowers with a slightly bitter to sharp citrus flavour. 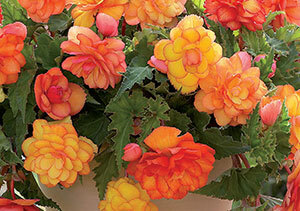 Tuberous begonia flowers contain oxalic acid, so should be avoided by people suffering from kidney stones, gout, or rheumatism. 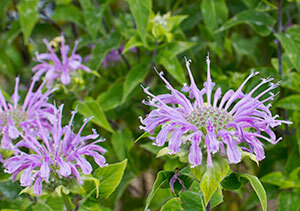 Bergamot, wild – This plant (Monarda fistulosa) may be listed as bee balm, Monarda, Wild Bergamot, Oswego Tea, or Horsemint. The flowers (and the young leaves) have an intense flavour of mint with undertones of citrus and oregano. This plant that has a scent highly reminiscent of Earl Grey tea. Somewhat confusingly, the "oil of bergamot" used to flavour Earl Grey is actually derived from citrus peel from the Bergamot Orange. 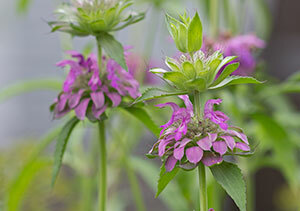 Monarda flowers are formed by large clusters of edible tubular petals that can be separated before adding to cakes, fancy drinks, or salads. 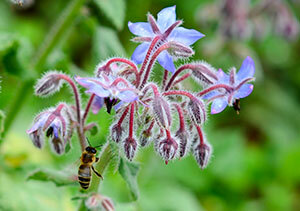 Borage – This familiar garden herb (Borago officnialis) has furry leaves and exquisite blue, star-shaped flowers. Both have a cooling taste reminiscent of cucumber. Try some of the flowers in a summer lemonade or sorbet – or a gin & tonic! They work particularly well as garnishes for gazpacho, cheese plates, or just sprinkled over salads. 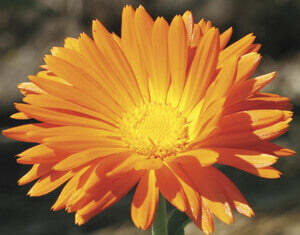 Calendula – All “pot marigolds” (Calendula officinalis) have flower petals that are edible. They have a nice flavour that ranges from peppery to bitter, and they add bright yellow, gold, and orange colour to soups and salads. They may even tint some dishes like saffron does. 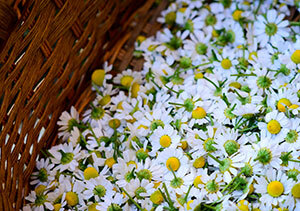 Chamomile – Choose the German chamomile (Matricaria chamomilla syn. M. recutita) for its daisy-like flowers. They can be used fresh or dried, and make a particularly nice tea that tastes vaguely like apples. Drink the tea in moderation – some allergy sufferers may have a negative response. Otherwise, sprinkle the petals into salads and soups. Chervil – The lacy leaves of this shade-loving herb (Anthriscus cerefolium) are topped by delicate white flowers borne in umbels. Both the leaves and the flowers have a very mild anise or licorice-like taste. Add chervil to your dishes just before serving to maintain the best flavour. 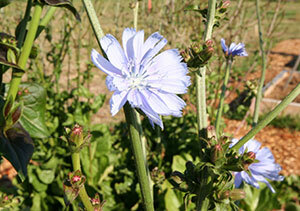 Chicory – All endive varieties (Cichorium endivia & C. intybus) produce, at summer’s end, tall stems with striking, sky-blue flowers. The petals can be pulled off and added to salads for their earthy, endive-like flavour. The unopened flower buds can also be pickled like capers. 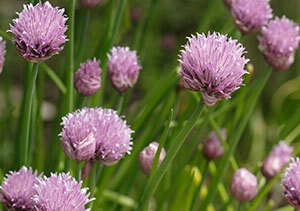 Chives – The flowers of chives (Allium schoenoprasum) are ball-like clusters of hundreds of little florets that can be separated and scattered onto salads for colour and a mild onion flavour. Chrysanthemum – The edible chrysanthemum and garland Chrysanthemum (both are Leucanthemum coronarium) that we offer produce both edible young leaves and appealing white daisy-like flowers with yellow centres, or flowers that are entirely yellow. The petals of both types are edible and faintly tangy. Cilantro – This leafy herb (Coriandrum sativum) is also known as Coriander. In summer heat it is quick to bolt, and will send up tall umbels of white flowers. These have an intensely herbal flavour, just like the leaves, roots, and seeds of the plant, and can be used as a garnish where cilantro leaves would otherwise be used. 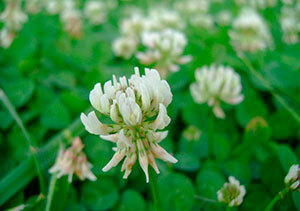 Clover – The flower heads of clover (Trifolium spp.) are edible, and have a sweet, mild liquorice flavour. In fact, the whole above ground plant is edible, but it’s best to grow clover as tender sprouts or to use the flower tubes in moderation as a salad garnish. Mature clover is tough to digest, and may cause bloating. Cornflower – The pretty, blue flowers of cornflower (Centaurea cyanus) have a slightly spicy, clove-like flavour with a subtle sweetness. 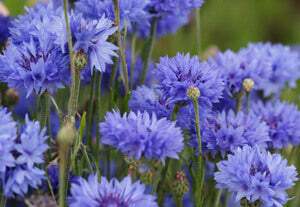 Cornflower petals look wonderful in salads. Use torn petals as a garnish, or whole flowers in fancy drinks. Dame’s Rocket – The petals of this tall relative of mustard (Hesperis matronalis) are pink, lavender, or white, and always come in fours. Perennial Phlox looks similar, and also has edible flowers, but always have five petals. The petals (and the immature leaves) of Dame’s Rocket are worth adding to salads, but have a mild bitter flavour. Dandelion – The ubiquitous dandelion (Taxacum officinalis) is entirely edible. 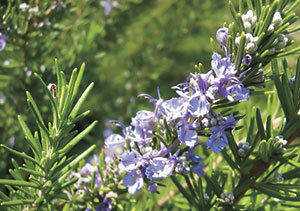 When picked small, and unopened, the flower buds have a surprising sweetness, reminiscent of honey. Young greens are also tasty either raw or steamed. Dandelion petals look very nice when scattered over pasta or rice. 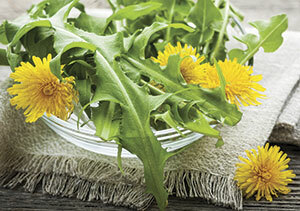 While dandelions are rather easy to come by, make sure to harvest them only from organic gardens. Avoid any grown near roads or picked from lawns where chemicals may be present. 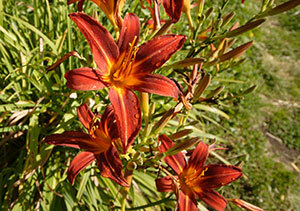 Day Lilies – The fleshy, short-lived flowers of day lilies (Hemerocallis spp.) are sweet, with a flavour resembling mild melon or cucumber. Make sure to cut the tasty petals away from the bitter base of each flower. Try them in salads! Eat in moderation. 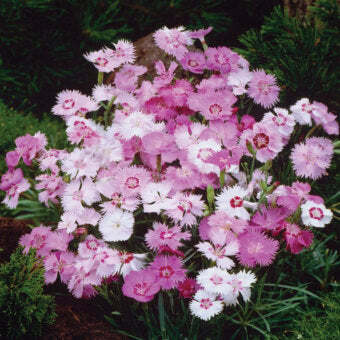 Dianthus – Look for the large-flowered carnation (Dianthus caryophyllus), and cut the sweet tasting petals away from the bitter white base of each flower. The bright red and pink petals have a mild clove flavour and are great for desserts or salads. Dill – Stronger in flavour than the leaves, the flowers of dill (Anethum graveolens) can be used when cooking fish, or raw in salads. 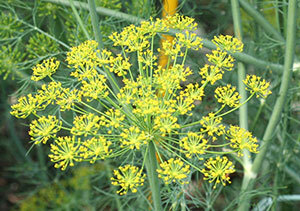 They are very small, yellow, and borne on tall umbels. Best used when they have just opened, as they set seed quickly. English Daisy – The low growing flowers (Bellis perennis) have a bitter flavour, but are entirely edible. They are small enough to use simply by sprinkling the petals onto salads or other meals, and will not overwhelm stronger flavours. 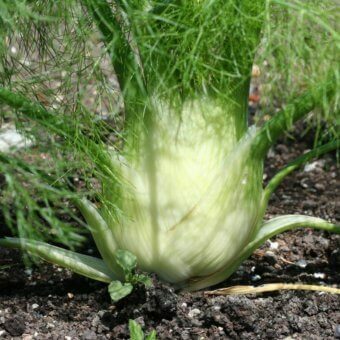 Fennel – Both the garden herb and the vegetable Florence fennel(both are Foeniculum vulgare) will eventually produce attractive and tall umbels of tiny yellow flowers that have the same mild licorice flavour as the leaves. These work very well in desserts! 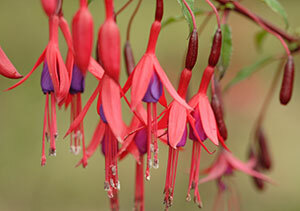 Fuchsia – Avoid nursery-bought Fuchsia (Fuchsia x hybrida) flowers, as they may have been sprayed. Otherwise, the extraordinary looking flowers make great garnishes and have a slightly acidic flavour. Garlic – Allowed to open, garlic flowers (Allium sativum) are pink to white, with florets that can be separated and inserted into salads for a mild garlic zing. However, allowing the plants to flower may divert energy that would otherwise go to the bulb. 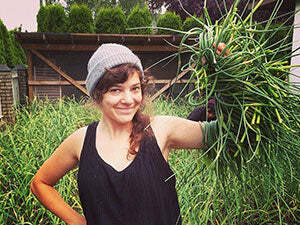 Many garlic growers prefer to cut the flower stems (scapes) before they open. These can be sautéed in butter for an intense, early summer side dish, or run through the food processor and mixed with Parmesan cheese, olive oil, and pine nuts for a sensational pesto. 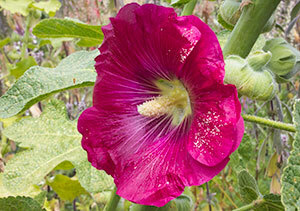 Hollyhock – The large, brightly coloured flowers of common hollyhocks (Alcea rosea) have almost no flavour of their own, but they sure look nice cut into salads or sprinkled over desserts. Be sure to use the petals only – cut these away from the central structure of the flower just before serving. Honeysuckle – The long flower tubes of various honeysuckle species are edible, but Japanese honeysuckle (Lonicera japonica) is best, with its distinctly honey-like flavour. Do not eat the berries that follow, or any other part of the plant, as they are all poisonous. Impatiens – The flowers of Impatiens (Impatiens walleriana) may be bright white or shocking red, but the petals are edible and have a surprisingly sweet taste. They can be torn into salad or mixed into fancy drinks. 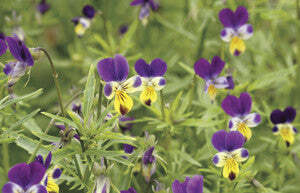 Johnny-Jump-Up – This plant (Viola tricolor) produces masses of small, brightly coloured flowers that have a faint wintergreen taste. They look great served on cakes, served with soft cheeses, or as a topping for salads. Use the whole flower intact. Lavender – Pull the clustered flowers of lavender (Lavandula angustifolia) apart and sprinkle a few pieces onto chocolate cake. Submerge one or two pieces in a glass of chilled champagne. The sweet, intensely floral flavour of lavender should be used with restraint, but adds an incredible to pop savory dishes as well as desserts. Lemon Bergamot – Like its wild cousin above, Lemon Bergamot (Monarda citriodora) has a perfume-like, intense, almost astringent quality, but it is strongly scented with citrus. 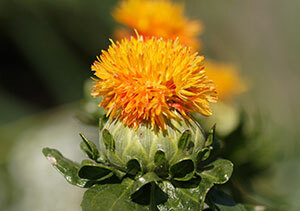 Use portions of the flower conservatively in drinks or desserts or in herbal teas. Lilac – Like lavender, the flowers of lilac (Syringa vulgaris) have an intensely floral, almost perfumey flavour with lemon undertones. A little goes a long way, but one or two individual flowers added to a summer punch looks wonderful and tastes very refreshing. 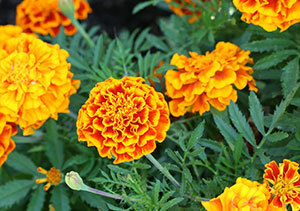 Marigold – Both French marigolds (Tagetes patula) and African marigolds (T. erecta) produce flowers that are technically edible, but the pungent scent is probably worth avoiding. African marigold flowers are used as a food colourant in Europe, but have only been approved for use as a poultry feed additive in the US. However,T. 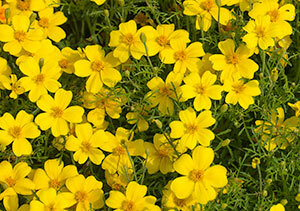 tenuifolia has a refreshing citrus, lemony flavour, and its petals work well torn into salads or smart drinks. 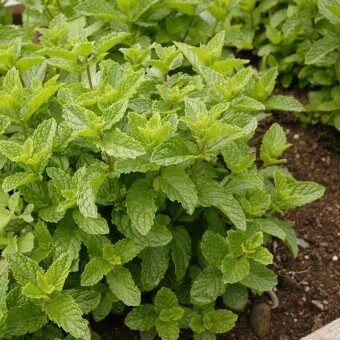 Mint – All mint varieties (Mentha spp.) have minty-flavoured, edible flowers that may be sweet or lemon-scented, or even with chocolate overtones depending on the type. Nasturtium – All garden nasturtiums (Tropaeolum majus) produce edible flowers and leaves. Even the fresh seeds can be pickled like capers. Curiously this familiar garden flower is a cousin of the Brassica family (cabbage, broccoli, mustards, etc…). All parts of the nasturtium have a pleasant, sweet, peppery flavour. The flowers can be used whole to decorate salads and a variety of other foods, but you may want to remove the long spur at the back of the flower, as this is the nectary and may harbour small insects. 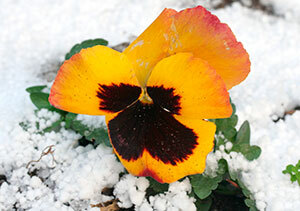 Pansy – The flower petals of the familiar garden pansy (Viola x wittrockiana) are edible and highly decorative. The petals have little flavour, but the whole flower can also be used. It has a grassy, wintergreen undertone that works well in fruit salad. 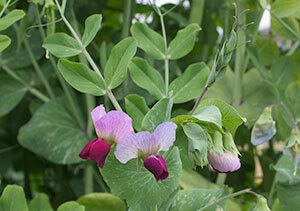 Pea – Edible garden peas (Pisum sativum) produce edible flowers that look great in salads. Serve a blend of peas in a meal: shelled peas, pea tendrils, pea pods, and some flowers for garnish. Note: Ornamental sweet peas are poisonous. Perennial Phlox – Be certain that you’ve got the tall-growing perennial garden Phlox (Phlox paniculata), and not the inedible annual, creeping type before you try the flowers. 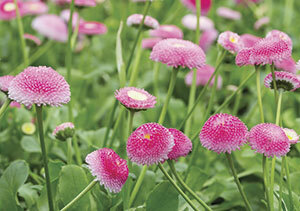 The perennial type bears pink to white flowers with five petals that have a pleasant, peppery flavour. They look great and taste great in fruit salads. Primrose – With its bland, but highly colourful flowers, primrose (Primula vulgaris) is worth cultivating if only to tear its petals into a few summer salads. The flower buds can also be pickled, steamed, or fermented into wine. Queen Anne’s Lace – The Wild Carrot (Daucus carota) produces tall umbels of exquisite, tiny, white flowers, each one marked by a blood-red centre. Although this plant is grown for its decorative, edible flowers, it can cross-pollinate with its close relative the carrot, so if you happen to be growing carrots with the intent of saving seed, avoid this plant in your garden. 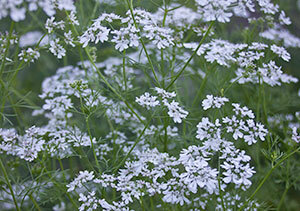 The flowers of Queen Anne’s Lace have a mild, carroty flavour. Be absolutely certain that the plant you are harvesting is not the invasive weed known as Wild or Poison Hemlock (Conium maculatum), which looks very similar. The stems of Queen Anne’s Lace are hairy, while Poison Hemlock has smooth, hollow stems with purple spots. Rose – Another surprisingly edible garden flower is the rose (Rosa spp.). Although its petals are intensely perfumed, their flavour is subtler and a bit fruity, with complex undertones that depend on the variety and soil conditions. The petals of all roses are edible, but you should remove the bitter white base of each petal. 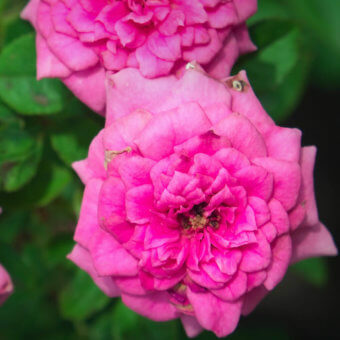 Be sure to use only rose flowers that have been organically grown from a reliable source, as nearly all nursery or cut flower roses will have been treated with pesticide. Rosemary – It takes nimble fingers to pull the strongly scented flowers of rosemary (Rosmarinus officinalis) from between the tightly packed leaves. The leaves contain more oil than the flowers, but both are similar in flavour. Use the flowers as you would the herb. Flowers are deep blue to pink, depending on the soil. Safflower – The dried yellow flowers (Carthamus tinctorius) are sometimes sold as Mexican saffron, and used like saffron as a food dye. Otherwise, fresh petals can be torn into salads, soups, and sauces. They have a very mild flavour of their own. 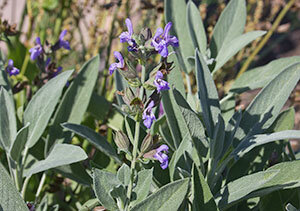 Sage – The deep blue flowers of sage (Salvia officinalis) add an interesting mild-sage flavour to salads or savory dishes. Pull individual flower tubes from the stems and use with discretion, as the taste is strong. 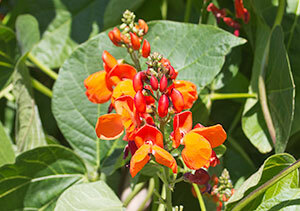 Scarlet Runner Bean – The flowers of this vine (Phaseolus vulgaris) are vivid, intense red, and also delicious. They make excellent garnishes for soups and salads, providing a real visual high note. 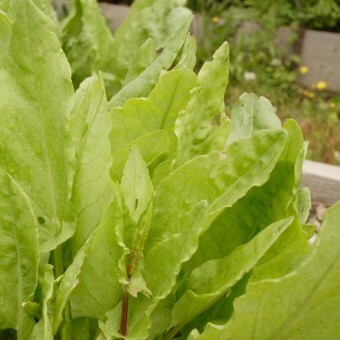 Sorrel – Like the leaves of sorrel (Rumex acetosa), its flowers have a strongly lemony flavour, and can be scattered over salad or used in sauces. The flavour comes from oxalic acid, so should be avoided by those with kidney conditions or rheumatism. 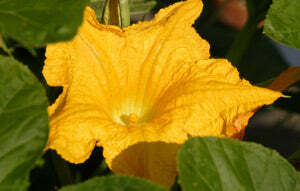 Squash – Both male and female flowers of all squash and zucchini varieties are edible, and have a faint squashy flavour. It may be sensible to only use the male flowers, as they will not form fruits. They can be torn into salads or stuffed with savory items like herbs and goat cheese, and then fried in a light tempura batter. There are many squash blossom recipes online. Sunflower – It’s still a little known fact that unopened sunflower (Helianthus annuus) buds can be steamed or sautéed in butter and served whole. They have an artichoke-like flavour. Alternately, the petals can be pulled from the edge of the opened flower and added to soups and salads. Their flavour is somewhat bitter. Violet – Many varieties (Viola spp.) are suitable for decorating food. They come in a range of sweet, perfumed flavours, and a wide range of colours. Some of the tiniest violet flowers make the best additions to cakes, drinks, and salads.